The loss of salmon into the upper Columbia Basin was a monumental, inadequately mitigated, and bilateral infringement on the cultures of native salmon peoples and a loss of economic opportunity for all residents of the Pacific Northwest, including the commercial fishing industry. Beneficiaries of the coordinated, bilateral development of the Columbia River Basin have not adequately mitigated for this loss, in no small part because they underestimated the scope and challenge of doing so. The modernization of the Columbia River Treaty presents an opportunity to address this injustice. Progress through these phases would occur only after successful conclusions or outcomes from previous phases. Efficiencies in implementing these phases should be achievable if undertaken in a comprehensive and bilateral approach. Testing of fish passage could be accomplished in a sequential manner with interim passage facilities shared between U.S. and Canadian projects. 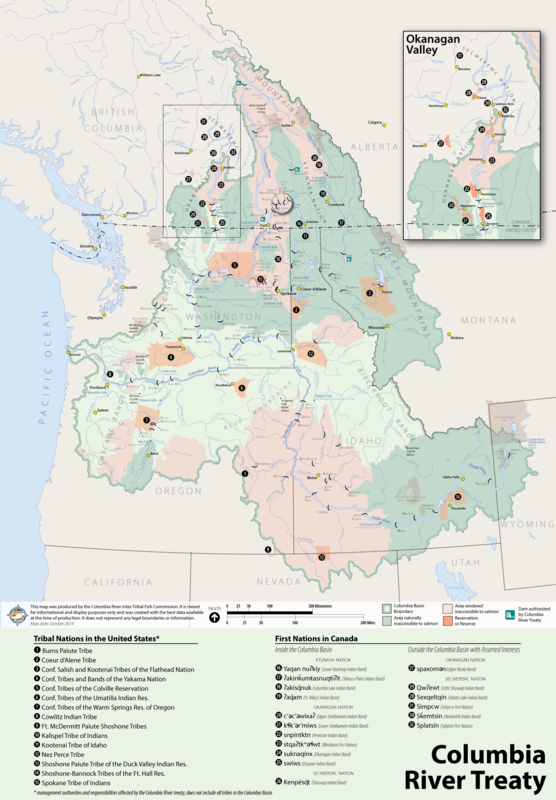 In addition to restoring the cultural and subsistence values of salmon to indigenous peoples, restoring salmon and steelhead access to the upper Columbia Basin may be critical to bolster their viability in the face of expected and imminent climate change by providing salmon access to the cooler waters above Grand Coulee Dam and into Canada. A more detailed fish passage paper and proposal, focused on the upper Columbia, is being developed jointly by the tribes and First Nations for presentation soon to their respective federal governments. The upper Columbia River Basin in the U.S. and Canada once produced annual runs of 1 to 3 million salmon and steelhead and provided habitat for lamprey, sturgeon and other fish species. These aquatic resources were critical to the cultures, spirituality, subsistence, and economies of Native Americans and First Nations in Canada. Fish access to the upper Basin was lost with the construction of Grand Coulee Dam and further diminished with the construction of Chief Joseph Dam in the U.S. and Hugh Keenleyside (Arrow), Brilliant, Waneta, and other dams in Canada. The potential for restoring fish passage back into the upper basin was foregone with the ratification of the Columbia River Treaty that led to construction of additional dams and management of river flows counter to the health and viability of upper basin salmon. The cumulative decisions in the U.S. and Canada to block fish access and inundate habitats were made over the objections or without consultation and consideration of Native American and First Nations’ rights. Since Treaty ratification, awareness and interpretation of these aboriginal rights has been considerably clarified. In recent years, science and technologies have been developed that can effectively pass adult and juvenile salmon and other fishes over existing dams, though the larger Treaty dams and reservoirs will present greater challenges. These new facilities are being installed at other dams throughout the Pacific Northwest, including Round Butte and Cougar dams in Oregon and Upper Baker, Lower Baker, and Lewis River dams in Washington. Specifically include fish passage restoration and reintroduction into the upper Columbia River Basin as an element and action item within a modernized Columbia River Treaty. Modernized Treaty operations should not interfere with other opportunities to restore fish passage and reintroduction of anadromous fish in other blocked areas of the Columbia River. Undertake a comprehensive, bilateral approach to salmon reintroduction that targets Chief Joseph and Grand Coulee dams in the U.S. and Arrow, Brilliant and Waneta dams in Canada. Tribes and First Nations should have a leadership role in this fish passage effort. With bilateral agreement, the planning and testing phases of this proposal could and should be initiated promptly once there is agreement to pursue modernization of the Treaty. A modernized Columbia River Treaty should include both a commitment to study and then implement fish passage based on positive study results. Now is the time to make fish passage into the Upper Columbia a reality. Visit the Upper Columbia United Tribes website to learn more about the work being completed to support bilateral negotiations regarding salmon passage and restoration. 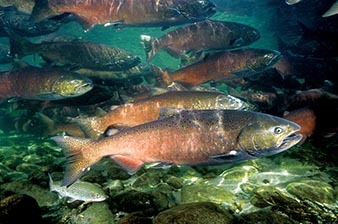 Not all of the Columbia River Basin is accessible to salmon. Some areas are blocked naturally behind major waterfalls that formed a passage barrier. Other area have been blocked by human interference, primarily dams without fish passage. This map shows both types of blocked areas in the basin. Click here to download a 11x17 high-resolution PDF version of this map suitable for printing.